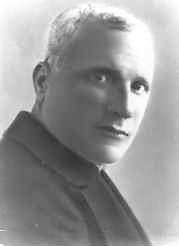 The Brontese Vincenzo Schilirò, (7.1.1883 - Catania 3.7.1950) priest, professor, was a singular figure of sociologist, critic, scholar and poet ("educator and scholar" defines him Nicola Lupo in his meticulous historical research, published in this site). He was born in Bronte on 7 January 1883 from Carmelo and Anna Maria Minio. He studied at the Real Collegio Capizzi obtaining the gymnasium license in 1898 with the highest marks; he continued his studies at the Catania Seminary, where on 22 December 1906 he was consecrated as a priest by Archbishop Giuseppe Francica-Nava. He graduated in the Royal University of Catania in 1912, at twenty-nine, presenting as thesis "The Carduccian belief" that was a revelation and an amazement. But as the Schilirò not attending the courses of the faculty was little or nothing known by the professors of the University and also for the originality of the subject and personal style, perhaps for the cassock that he wore, the doubt arose among the professors that work was not the result of one's sack. Some of them, moved by sectarianism then in fashion, even advanced the suspicion that the work was a maneuver of intrusive clericalism that aimed to reclaim the belief of Carducci atheist. The Commission slipped a few months to obtain the title by requesting a new essay written to Schilirò. It was in this way that in October of the same year he presented, as well as the Carduccian belief and its value, a second work which, despite its diversity, complements the previous study, that is, Romanticism and pedantic friends, the discussion of which was a success and lively satisfaction for Savj-Lopez, who repeatedly invited the Schilirò to make contact with the Florentine literary cenacle of which he was an influential member. After obtaining a doctorate in Literature, Schilirò accepts for campanilismo the teaching in the Lyceum of The Real Capizzi College, bringing you oxygen and new ideas. He taught Italian letters for a decade and in the sleepy Bronte was appreciated for the volcanic social and educational initiatives. He continues his studies, works, publishes texts without seeking glory, fame or wealth, satisfied mainly for having expressed what was fantastic and positive was contained in his multifaceted mind. It satisfies its love for science by externalizing it and extending it to the less able, sees in this the social and educational purpose of Culture. In addition to being a teacher and playwright, he also distinguished himself as a social and financial worker, a journalist and also as a politician. Founded, in various times, four newspapers, an Agricultural Bank, a cultural circle and a typography, (the glorious Social Typography, publisher of a great deal of books, of mostly local authors). He adhered to the Popular Party and the new tendencies, in the social field, expressed by the modernism and not seen favorably by Pope Pius X, reason for which he moved away from the church, without however stopping to wear the cassock. The art, poetry, aesthetic criticism were the field where he could better express his lively intelligence. But his first experiences were of publicist with the humorous sheet "U Trabanti" (a jumble of dog Latin and vernacular), with the periodic "Protagonist" (who after the sentence inflicted by Pius X° in 1907 ceased to exist), the fortnightly "Domani" (Tomorrow) (of political administrative character, turned to give a contribution to the organization of the brontese farmers), with "Nuova Juventus" (destined to the pupils of the Capizzi) and at last, the direction (together with Pietro Mignosi) of the literary magazine "The tradition". Withdrawn from teaching for health reasons, he moves to Catania and in his habitation of Via Morosoli continues the literary production. Died at 67 years following a cerebral hemorrhage. He is buried in the family chapel of the Bronte's cemetery. Among his works we remember Aesthetics notes (1924, Bronte), The Romanticism and "the pedantic friends" (1912, Bronte), The aesthetic reasons of the dannun­ziana art (1918, Catania), Carduc­ci's belief and his value (1918, Bronte), F. T. Marinetti and the futurism (1919, Catania), How I see Pirandello, Freedom and democracy (Seli, Rome). There are also numerous novels (the last of 1946, entitled Iadwiga (Gastaldi, Milano 1946) written during the fascist period, however, the press was not authorized by the Ministry of Popular Culture; several theatrical works (some published) that he wrote to delight young people in high school and fellow citizens, one of these: «Il matto jester», was played by the great forgotten Biancavillese composer Carmelo Sangiorgio, also a professor in the Bronte College. Published works in verses: Sad spring (1912, Bronte), Santo Francesco (1931, Bronte), lyric short stories (Who sows but does not reap); two dramas: The culprit (1919 Bronte), Il Carroccio (The wagon, 1931 Bronte) and a comment to Divine Comedy of Dante in three volumes, by now unobtainable. "It is enough to run the list of his works to realize the vastness of his inte­rests". From the translation in verses of "Arte poetica di Orazio" (Horace's Poetic Art), written at eighteen years of age, but published in 1910, to the essays on poets contempo­rary to him, (Carducci, D’Annunzio, Ada Negri, F. T. Marinetti) to the drama "Santo Francesco", which represents, in five acts, the events of the life of the Saint from 1207 to his death (1226), to the novel "Jadwiga" (1946), to mention some of his works, that show ver­satility and a variety of cultural dedication, emerges the figure of a man of solid literary preparation and of artistic fineness, that is not easy to find".